Actress Soha Ali Khan instagrammed pictures from what appears to be her baby shower (none of the pictures revealed the occasion) on Wednesday and we can't just stop admiring Soha in those pics. 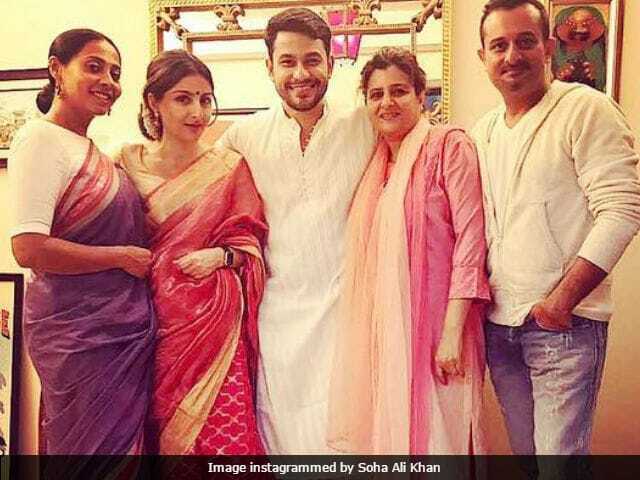 In one of the pictures, Soha, dressed in a gorgeous pink sari, posed with her husband Kunal Khemu. Soha's other post is a collage of pictures summarising the day's best moments - our favourite was when Soha snuggled her pet. Soha wrote in a caption: "The love of family and friends is reason enough to dress up! (sic)." Meanwhile, Soha Ali Khan was also accused by some Instagram users of not being Muslim enough for wearing a sari and not posting Eid greetings. After Soha shared pictures of the baby shower, she was congratulated by friends and followers in the comments section. Actress Neha Dhupia, who attended Manish Malhotra's party the same night, complimented Soha and wrote: "Nins, Sohe... You both look so pretty (sic)" Actress Celina Jaitly, who is pregnant with twins for the second time, also wrote: "You look beautiful @sakpataudi congratulations on your pregnancy! (sic)." The love of family and friends is reason enough to dress up! Soha Ali Khan, 38, married Kunal Khemu, 34, in 2015. Soha is the daughter of late cricketer Mansoor Ali Khan Pataudi and actress Sharmila Tagore. Actor Saif Ali Khan is Soha's brother and their sister's name is Saba Ali Khan. Soha debuted as an actor in 2004 Bengali film Iti Srikanta and in the same year she also starred in her first Bollywood film Dil Maange More opposite Shahid Kapoor. Soha has featured in films like Rang De Basanti, Tum Mile and Antarmahal. Her last film was Ghayal Once Again, co-starring Sunny Deol.